This has to be one of the most requested recipes I have ever made. it’s thick and creamy and will warm your body from the inside out. I love to make this baked potato soup recipe, and it’s one of my families most requested recipes. I’ve tested out a few slow cooker potato soup recipes and I always go back to this one. It’s by far the easiest and is a true slow cooker recipe. You don’t need anything else other than your slow cooker to make this creamy potato soup recipe. How do you make a creamy slow cooker potato soup? The trick with making this slow cooker potato soup thick and creamy is all done on the last 30 minutes of cooking. After you have cooked the potato mixture on high for 4 hours, add one cup of half-and-half and stir well. Cook for an extra 30 minutes and then serve. It makes the soup so creamy and delicious and it’s a step you definitely don’t want to miss! How do I make the best potato soup? The best potato soup is loaded with flavor and can be served plain or with your choice of toppings. The best potato soup is made with a base of onion and potatoes and cooked in a slow cooker on high for at least 3 hours. After 3 hours, mash the potatoes to make it creamy, and add in additional items like cornstarch to thicken over the last hour if needed. 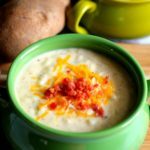 I love loaded potato soup, and adding toppings such as sour cream, green onion, bacon, and cheese can take an already amazing potato soup and make it mouthwatering delicious. What are the ingredients for slow cooker potato soup? What seasonings are good in potato soup? Chopped onion and salt and pepper are the best base seasonings for any good potato soup. Another way to flavor and season potato soup is by adding cooked bacon pieces to the potato soup mixture before cooking. How do you thicken slow cooker potato soup without flour? You can omit the flour from the recipe and still thicken this slow cooker potato soup. Mash the potatoes to make the soup creamy after cooking for at least 3 hours. Add a little cornstarch to cold water and then stir it in the potato soup. Cook for an additional 30 minutes to an hour or until the potato soup has reached the desired thickness. What can I serve with potato soup for dinner? The hardest part is doing all of the prep work. While you are peeling the potatoes, use the microwave to cook the bacon. Chop up a medium red onion. Place the potatoes, cooked bacon, and the onion into the crock pot and set the temperature to high. Cover the potato mixture with 2 cups of chicken stock and add 1 Tbsp of ground black pepper. Cover and cook for 4 hours. If you don’t wish to use flour you can add cornstarch to cold water and add this to the recipe about 30 minutes before it is done. This step along with mashing the potatoes will thicken up the soup and help make it delicious and creamy. This is such a great recipe and one I run to when I don’t have an extra hour and a half at night to make my other homemade baked potato soup recipe. We also have this great guide to meal planning with free printables to help you save time, money, and lower stress when it comes to dinner time. A rich and creamy Slow Cooker Potato Soup that is easy and mouthwateringly delicious. Coat the cubed potatoes with flour and place in the slow cooker. Add diced onion, bacon, and sprinkle pepper over the potatoes. Pour chicken or vegetable stock over the potatoes and cook on high for 3 and 1/2 hours. Use a potato masher to slightly mash the cooked potatoes and add half and half. Cook an additional 30 minutes. Scoop soup into bowls and add toppings of your choice. To make without flour: Omit the flour and cook as instructed for 3 and 1/2 hours. Slightly mash the potatoes. Add cornstarch to cold water and add it to the potato mixture to thicken. Cook an additional 3o minutes. Yum! The toppings make it look even better!! I need to start using my slow cooker more! Oh my goodness you totally should use your slow cooker! I adore mine…I don’t know what I would do without it. It’s a lifesaver and timesaver…perfect for active busy parents who want to serve yummy meals! At least more than once a week, I realize how badly I wish we lived next door to each other. This. I am going to pin it and pray that Cassidy sees it and makes it for me for Valentine’s Day. I would make sure to feed you well if we were neighbors 🙂 I hope he makes it for you…you will totally love it! 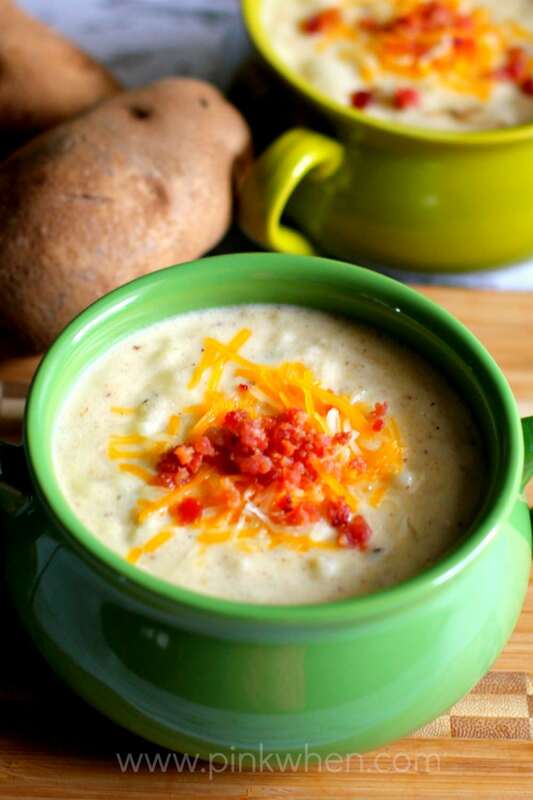 Yum – 2 of my favorite things combined – baked potato soup and the crock pot!!! You and I must be kindred spirits…they are both my favs, too! Yum! I love anything that has anything to do with potatoes. I also love my slow cooker. This is on my “to try” list. I hope your having a great Friday! You are going to LOVE this!! It is totally amazing. Seriously. Potato soup is one of my favorite cold weather dishes! I never really thought about making it in the slow-cooker! Thanks! And I love the bowls you have them in! Thanks Tracey! It is also a fave of mine and when I make this in the slow cooker, it tastes just as good, if not BETTER then when I slave over the stove for an hour and a half! Your loaded baked potato soup would be perfect for all the cold weather we are having. Thanks for linking up at Saturday Dishes “CROCK-POT” blog hop. This looks awesome! I have a potato soup recipe but it is way different so I am going to have to try yours out! Ohh…I made this last night and had it for dinner. It really is delicious! Any way you make potatoes makes this girl happy. Being from southern Idaho where the potatoes are grown, I love potatoes. And potato soup is one of my favorite ways to eat them. I see bacon bits in the list of ingredients but I don’t see where they go in. Thanks for sharing at Saturday Dishes. Ahhh…this is why I need an assistant! LOL. Thanks for pointing that out, and it is added in during Step 2. I have updated it to reflect the oversight. Thank you!!! I love my slow cooker too! This soup looks delicious. Thanks for linking to the In and Out of the Kitchen Link Party. Hope to see you next week. Found this recipe a few months ago while I was away at school and it DEFINITELY de-stressed me during finals week. Thank you so much for sharing it! PLEASE tell me where you got those adorable bowls. Have you ever substitued chicken broth for the boullion and water? I just ask because I’ve found chicken broth that has lower sodium than boullion. Could milk be substituted for the half and half? You could do that, but it will take a way a little from the richness of the flavor.